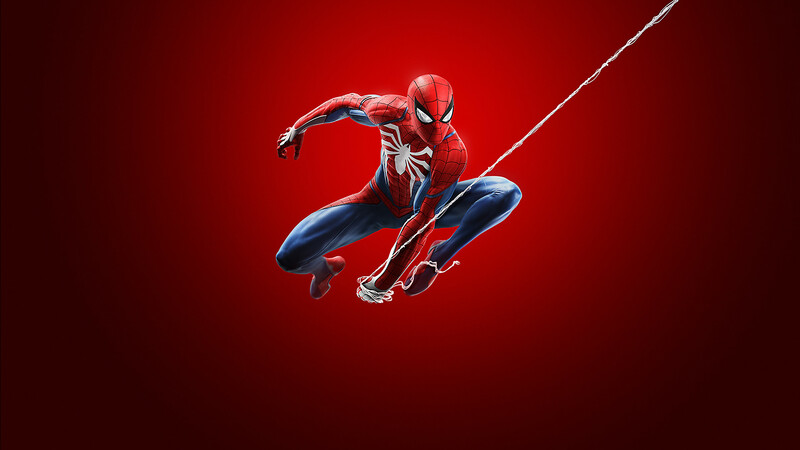 By this time, you have received knew powers and of course the new suit and you are ready to go out in the world and showcase your Skills. Captain Watanabe has the right job for you to showcase the new suit and skills in the gameplay settings. Because knowing your skills is one thing but if you can’t pull them off when they count, then it doesn’t really matter. So, let’s take the suit for spin shall we. Turns out that even in prison, Fisk is pretty much active in the crime world through his construction business to take out shady tasks. As you will find yourself in the lab still after an awesome stitch job, you should carry on right from there. Head over to the construction site marked on the map, if you don’t see the mark, then simply press R3 and you will have it revealed to you on the map. In case you think you need to juice up then go and take out some street thugs and fill up credits to craft some modes to help you in this mission. Doc Oc will send you a text message as you enter the construction site and this will unlock a range of new gadgets that you can craft. 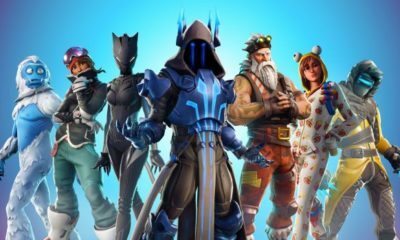 These gadgets will help you with the sneaky and stealthy take downs. 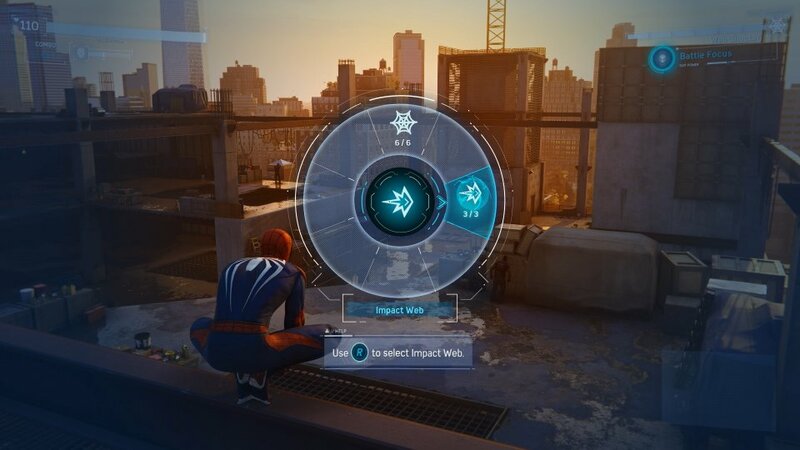 The first gadget is the Impact Web which will allow you to instantly web an enemy instead of having to fire multiple shots using the web shooter to accomplish the task. Tokens are always around for you to acquire to get more gadgets and upgrades, keep at it and max these items out. 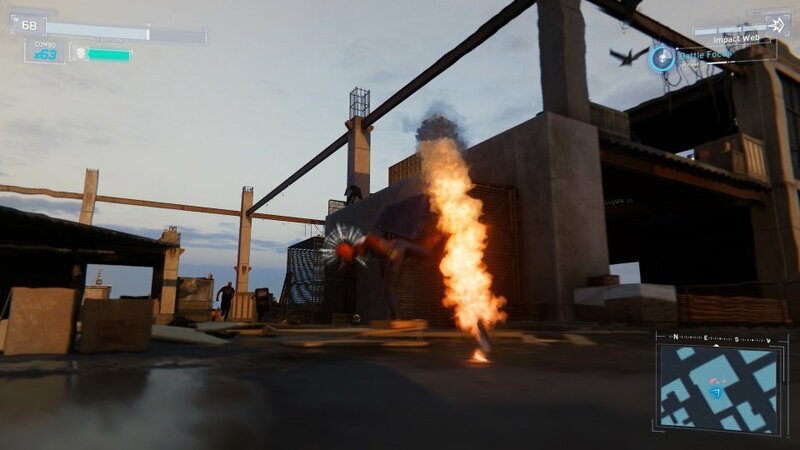 Impact Web will be quite handy for now, the best way to test it is using it on a bigger enemy – hold L1 and use a radial menu to select the new gadget, and fire to incapacitate the thug. 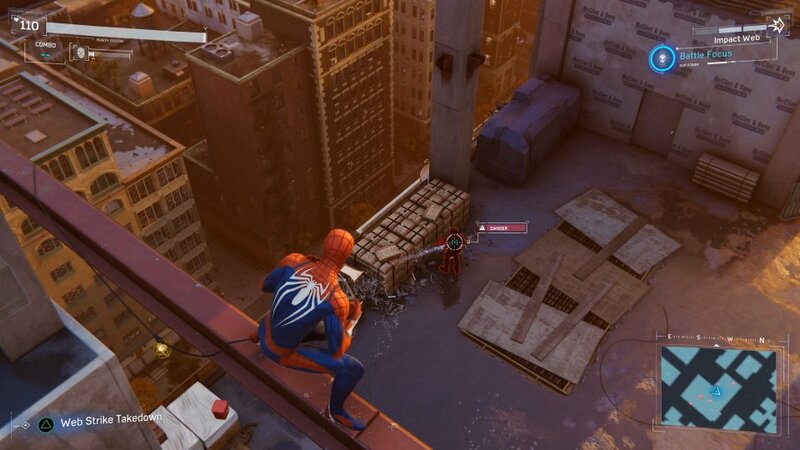 You will also have the opportunity to perform a bonus objective: Perform 10 finishers and Web 5 enemies to walls. Take your time and get it done. 12 more thugs will be around, patrolling the area, some will be armed on the upper levels and mid to weak level ones at the lower ones. Always try to climb up and get to a better vantage point to gain upper hand on them especially when you are facing a bigger group. 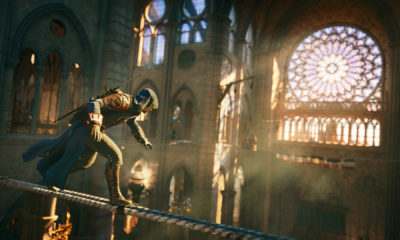 It also helps you to scout the area and come up with a strategy before you get on the ground and slug it out with them. Get yourself in range from the vantage point and press triangle to perform a stealth take down from afar, make sure no other baddies are there to spot you. 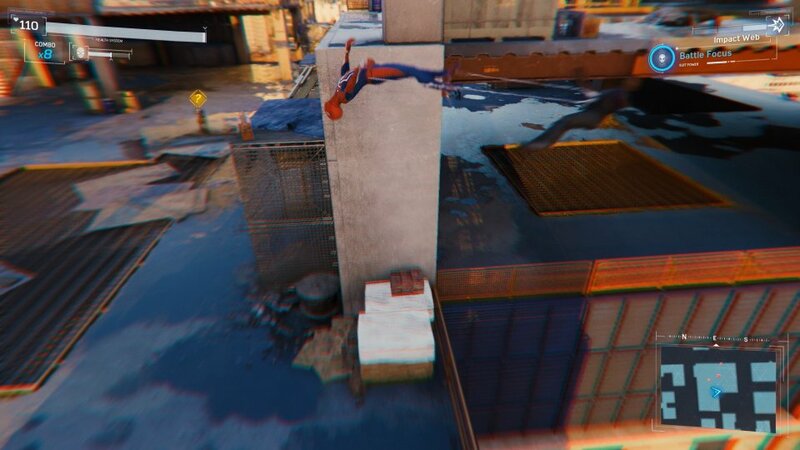 You can also angle yourself to Web them on the wall or hit them with another Impact Web. 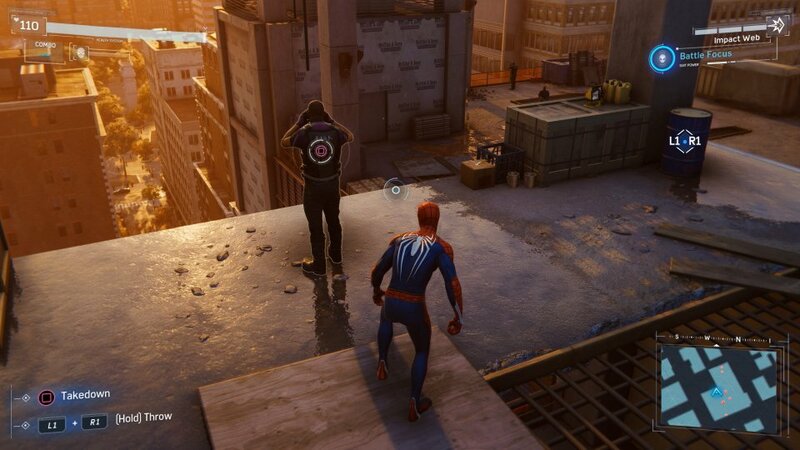 To earn bonus points, you can spray some Web Shooter. It is always the best strategy to take out as many thugs in stealth mode because once you are spotted and can’t take these guys out in time, they will keep calling reinforcements and you will have a real mess on your hands. As many as 6 waves can come at one time. We all need to blow some steam every now and then but believe me, even in normal mode, it will be too much. The area you will find yourself in right now, is rather large so you can escape the herd and take a breather and take them out with skills and strategy. With each wave, the tougher enemies will start to appear, including the shield bearers plus, taser-equipped thugs. Stun mines will be thrown at you or around you and you will need to get out of there as fast as you can. If hit by one of these mines, your vision will be blurred and in a situation like this, you need your senses working. You can pick up the mines in time and toss them right where they came from once you have the timing right but not any time sooner. We have discussed this before about the Shielded thugs, you must get behind them to cause damage otherwise, they will keep coming for you while the taser-equipped men require a good webbing similar to gun totting ones. Stick to aerial combat for it is the safest place to be in most situations, here is no different since not many of them will be armed with guns. Beware of the melee weapons since the Web Strike will be countered by them very quickly. 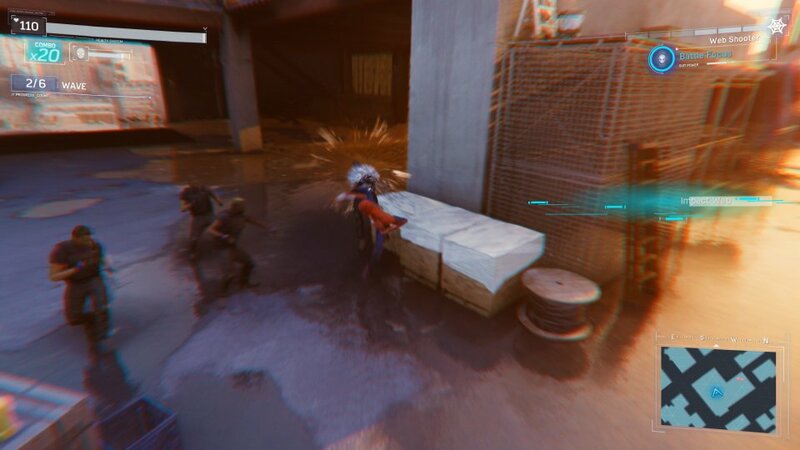 Unlock the Perfect Dodge skill and wait for the blue indicator to dodge bullets and you will mess up the enemies’ vision for a short period and you can take advantage of the situation and get close to them for a R&R. 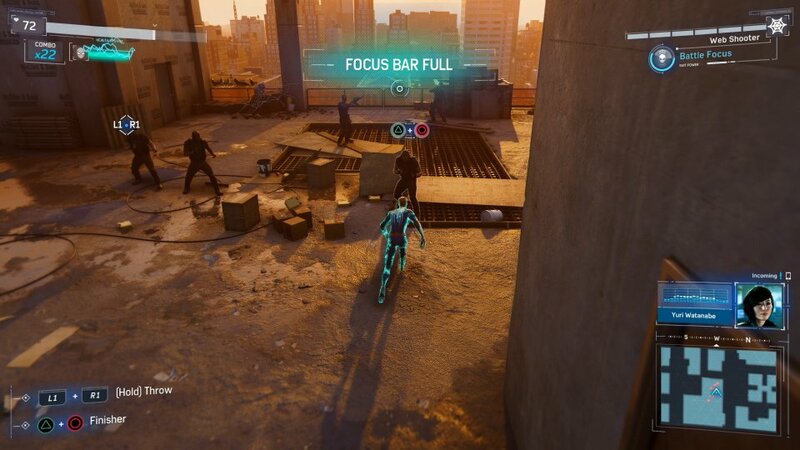 Battle Focus will allow you to quickly gain Focus when you press L3 + R3 but it has a long recharge. Using this will allow you to either heal or perform multiple take downs in a short period of time. Choose to use it sensibly and if you get knocked out then you will be thrown back a few steps but you won’t start from scratch. Final wave is all about upper levels where you will come face to face with thug holding a rocket launcher. You must dodge these or the damage will be significant. Close the distance between yourself and him and take him out. Use the environment and take down enemies as they run up. Try to recharge the Battle Focus ability and use it one more time to take out as many as you can. Once you clear the area, you will be awarded a Base Token, plus up to two more in case you manage to clear the bonus objectives. Fisk’s base will start to appear all over the map and you will also uncover more Satellite towers and we all know what happens when you fix them. 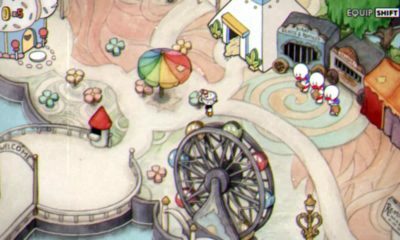 IN case you miss out on the bonus objectives then you can always come back to this areas and get it done but only expect the tokens for missed objectives. Unlike crimes, these cannot be repeated for more rewards. Keep a look out for tokens spread out the map and keep upgrading your suit and abilities for upcoming battles, but as for now, we will post more walk-through soon.